Once the site of the now well-established Zazu’s (relocated to the top of Gloucester Road) Poco had some fairly big, organic boots to fill. Happily, they’ve kept the local and seasonal focus – and, in my opinion, have gone one better than their predecessors with a menu packed with homemade ingredients and Mediterranean flavours. It’s quietly funky inside with bold paintings and creepers reaching for the Velux windows; indie folk plays and relaxed staff natter by the open kitchen as tables start to fill. Poco is famed for it’s tapas served late into the night, and pigs’ legs and bunches of garlic hung amongst the pots and pans testify to the Spanish theme. Breakfast follows a similar route, with homemade chorizo, chilli and coriander all featuring. Their breads, cakes and salads are all made from scratch too; ask nicely, and they’ll give you some of their sourdough starter (named Cleo) to take home. Despite a fairly nightmarish shift – flying orange juice, an unidentifiable leak, the fire alarm – we were served a very fine breakfast indeed. 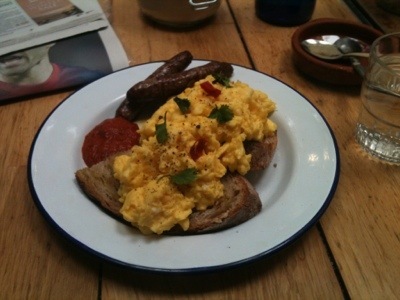 Their own harissa added a lovely kick to their scrambled eggs, matched by their spicy merguez sausages. The coffee is strong and they have their own fresh herb cordials: everything is flavourful and well matched. It’s a popular spot throughout the day, though like most Stokes Croft residents they don’t rise early at the weekend (breakfast starts at 10am). Some might find the service a little too relaxed, and there’s a slightly chaotic feel when they first open their doors. Come with time on your hands, though, and you can join the cool kids from the festival circuit and feel right at home. Price: From £3.90 (organic bacon butty) to £6.95 (Moroccan scramble).